As a regular 18th century stagecoach stop between New York and Albany, the Beekman Arms in Rhinebeck is among the oldest of American hotels still fulfilling its original purpose. Built in 1700 by William Traphangen, the inn, originally known as Bogardus Tavern, hosted such famed Revolutionary personages as Washington, Hamilton and Lafayette. During the early 19th century, the Beekman Arms served as headquarters for Governor Morgan Lewis. This entry was posted in Dutchess County, Hotels, Rhinebeck and tagged Beekman Arms, Bogardus Tavern, Oblong of the Hudson, William Traphangen on May 21, 2013 by hudsonvalleygal. 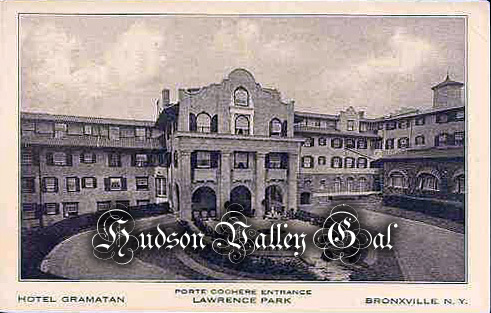 The oldest hotel in America was started in 1700 and is located right here in Dutchess County in Rhinebeck, N. Y. In the beginning it was a one story stone building built to provide bed and board for the traveler and to serve as a shelter for local residents against Indian attacks. Notables have visited here from early days including General Washington, Alexander Hamilton, Aaron Burr, DeWitt Clinton, Benedict Arnold and in later years, Franklin D. Roosevelt. It’s a pleasure to know that this historical landmark still serves the public every day of the year in the traditional manner of fine inn-keeping. You’re sure to enjoy their fine food and authentic atmosphere. Sift dry ingredients together. Melt butter and combine with eggs and milk. Blend apples and fruit glace and stir all into dry mix. Scoop into muffin tins lined paper muffin cups. Bake at 400° for 30 to 35 minutes. Makes about two dozen muffins. This entry was posted in Dutchess County, Hotels, Recipes, Rhinebeck and tagged Beekman Arms, Berinie Fitchette's Hudson Valley Recipe Book and Regional Commentaries, Rhinebeck on March 14, 2013 by hudsonvalleygal.